By the end of the twenty-sixth century, Earth lay in ruins. A millennium of mechanised exploitation and war had left it a sweltering, barren desert - greenhouse-hot, racked by hard UV, and poisoned by chemical and radioactive waste. Upon its surface rose the twisted skeletons of the Cities, where the bones of twenty billion humans whitened in the sun. On Mars the colonists watched as the supply ships came less and less often, till finally they came no more. Ever deeper they burrowed beneath the sands, maintaining the precious machines which won from the rusty rocks the water and oxygen they needed to survive. Food, barely enough for subsistence, grew in caverns lit by artificial suns. In that narrowing world of the Caves, much amenity was lost - but no knowlege - for the colony's only hope lay in technology. There could be no fallback preindustrial paradigm - only death - if the machines should fail. The computers and robots, solar cells and catalysers - the knowlege of how to repair them - were as basic to their survival as air and water. Early in the fourth millenium, the population began to increase. No crisis had threatened the colony for two centuries, and all that they consumed could now be made good. At last the automated factories, naked upon the surface, began to build again the things whose designs had lain dormant in the memory banks for eight hundred years. They began to build spaceships. 1. The Light (Eunomia Sunrise) 11'52"
5. Shadow of the Past 7'12"
* RFC Mess song, France 1917. Steve Bechervaise: keyboard & synthesiser. Craig Carter: guitar, vocals, keyboard. Vittorio Di Iorio: drums & percussion, keyboard, guitar. Paul Foley: vocals, guitar, flute, samples. Jeff Powerlett: bass guitar, vocals. Recorded between 2000 and 2005 at Atlantis, Lighting Lab, La Casa Di Iorio and BSCCD Studios, Australia. 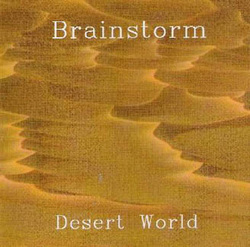 Engineered by Dave from Atlantis, Phil Schreck & Brainstorm. Cover design and photography: Jeff Powerlett. All songs written by Bechervaise, Carter, Di Iorio, Foley & Powerlett, except Mutants, written by Bechervaise, Carter, Eastaway, Foley, Lukeis, Simonite, arranged by Bechervaise, Carter, Di Iorio, Foley, Powerlett. Brainstorm would like to thank Phil Schreck and Mrs Di Iorio for their generous assistance: material, artistic, spiritual and culinary. All music and lyrics copyright Brainstorm 2004.